The Dallas Modern Quilt Guild recently participated in a challenge from the Michael Miller company using their Cotton Couture line. We were given 8 fat eighths of various pastel fabrics and given two months to create something using those pastels and any other Cotton Couture fabric we wanted. The fabric is beautiful, with a slight sheen and a beautiful hand, soft and almost silky. It is a dream to work with. The DMQG has another upcoming challenge to find an "inspiration" and make something based on that inspiration. I found my inspiration one evening watching HGTV when I saw a Benjamin Moore paint commercial called "A Color for Your 3 Year Old's Mural." I loved the way the colorful paint cans swirled across the screen and could see that translated into a quilt. When I saw the Michael Miller Cotton Couture fabric, all the pieces came together and I had my challenge quilt. The Michael Miller company will choose 3 winners of the challenge and award prizes. There were lots of fabulous quilts created, so I'll let you know after next month's meeting if I win anything. It's been a busy few weeks. In addition to a week-long trip to Orlando to see Miss Em and several days in Chicago for a meeting, I finished and delivered four quilts for former colleagues who retired last week. My goal, in addition to creating special gifts, was to make a small dent in all my scraps, so I used Bonnie Hunter's patterns for two of them. The first, for Kenneth, is a variation of Scrappy Trips. Kenneth is a fan of bright Hawaiian-style shirts. While I didn't use Hawaiian fabric in this, the bright colors remind me of him. 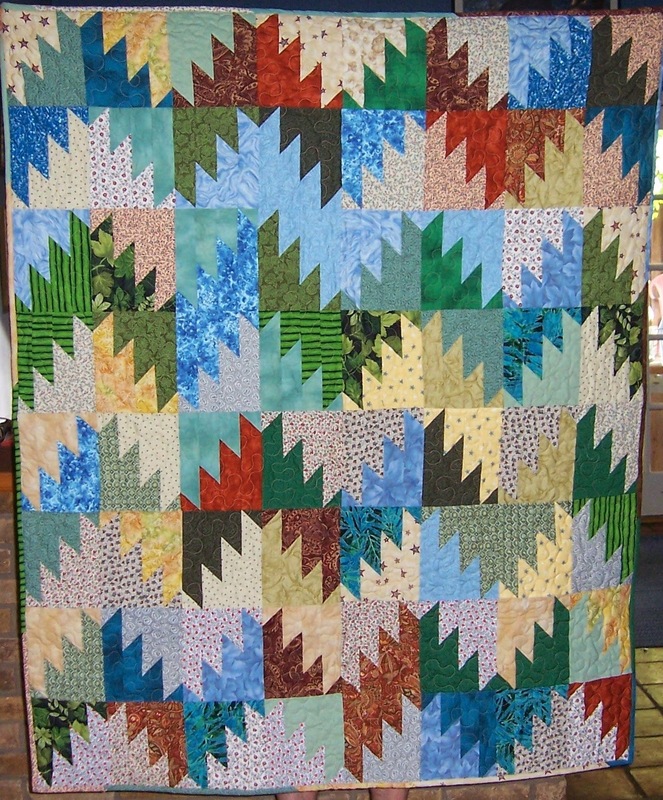 Robert's quilt uses the Scrappy Mountains pattern and is backed in a plaid flannel. His sister said it will go perfectly in his new apartment. 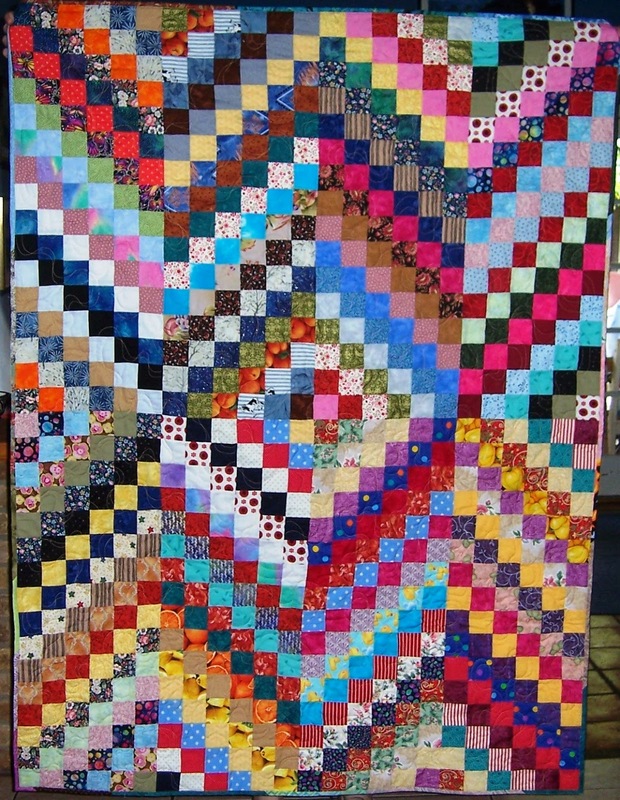 Therona's quilt used one of my favorite quick quilt patterns, a jelly roll race. 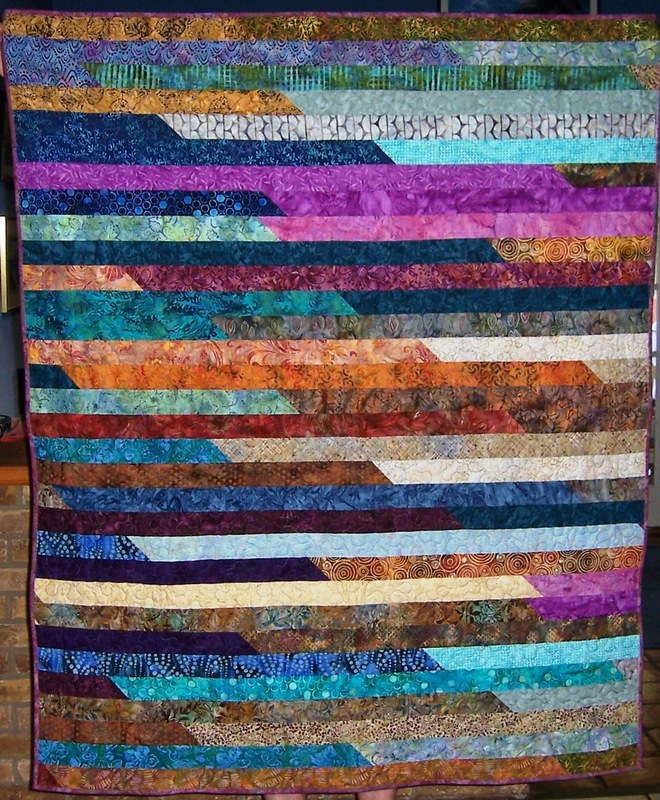 There are lots of videos that show how to make this quilt that uses just one jelly roll (or 40 2.5" WOF strips) and can be put together in just a few hours. She was quite pleased with it. 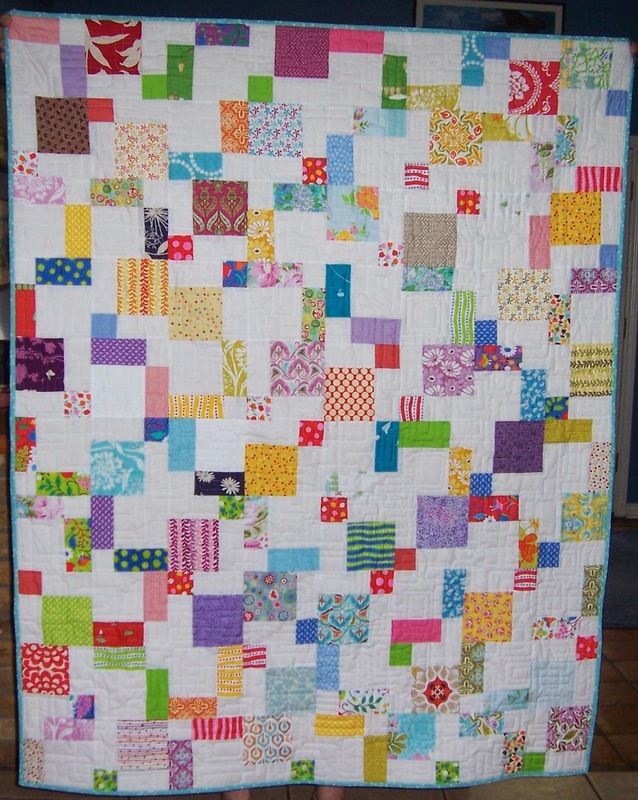 Finally, Anne's quilt is a disappearing nine-patch made with leftover charm squares alternated with solid white. It makes a very modern-looking quilt, perfect for artist Anne. All the recipients were very happy and, best of all, no new fabric was purchased to make these quilts!